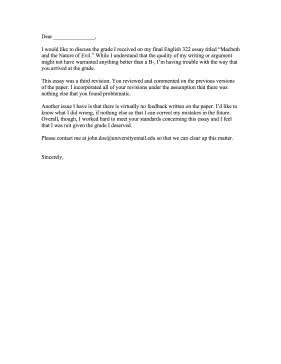 Students can use this education complaint letter to contest a bad grade given by a professor. I would like to discuss the grade I received on my final English 322 essay titled "Macbeth and the Nature of Evil." While I understand that the quality of my writing or argument might not have warranted anything better than a B-, I'm having trouble with the way that you arrived at the grade. This essay was a third revision. You reviewed and commented on the previous versions of the paper. I incorporated all of your revisions under the assumption that there was nothing else that you found problematic. Another issue I have is that there is virtually no feedback written on the paper. I'd like to know what I did wrong, if nothing else so that I can correct my mistakes in the future. Overall, though, I worked hard to meet your standards concerning this essay and I feel that I was not given the grade I deserved. Please contact me at john.doe@universityemail.edu so that we can clear up this matter.